In 1980, geographers Ernest Griffin and Larry Ford developed a generalized model to describe the structure of cities in Latin America after concluding that the organization of many cities in that region grew following certain patterns. Their general model (diagrammed here) claims that Latin American cities are built up around a core central business district (CBD). Out of that district comes a commercial spine that is surrounded by elite housing. These areas are then surrounded by three concentric zones of housing that decrease in quality as one moves away from the CBD. As many Latin American Cities began to grow and develop during colonial times, their organization was mandated by a set of laws called the Laws of the Indies. These were a set of laws issued by Spain to regulate the social, political, and economic structure of its colonies outside of Europe. These laws "mandated everything from treatment of the Indians to the width of the streets." In terms of city structure, the Laws of the Indies required that colonial cities have a grid pattern built around a central plaza. Blocks near the plaza were for residential development for the city's elite. The streets and development farther from the central plaza were then developed for those with less social and economic status. As these cities later began to grow and the Laws of the Indies no longer applied, this grid pattern worked only in areas with slow development and minimal industrialization. In faster growing cities this central area became built up as a central business district (CBD). These areas were the economic and administrative cores of the cities but they did not expand much prior to the 1930s. In the mid- to late 20th century the CBD began to further expand and the organization of the colonial cities of Latin America was mostly demolished and the "stable central plaza became the node for the evolution of an Anglo-American styled CBD." As the cities continued to grow, various industrial activities built up around the CBD because of a lack of infrastructure father away. This resulted in a mix of business, industry, and homes for the wealthy near the CBD. Around this same time, Latin American cities also experienced in-migration from the countryside and high birth rates as the poor tried to move closer to cities for work. This resulted in the development of squatter settlements on the edge of many cities. Because these were are on the periphery of the cities they were also the least developed. Over time, however, these neighborhoods became more stable and gradually obtained more infrastructure. In looking at these developmental patterns of Latin American cities, Griffin and Ford developed a model to describe their structure that can be applied to almost all major cities in Latin America. This model shows that most cities have a central business district, one dominant elite residential sector, and a commercial spine. These areas are then surrounded by a series of concentric zones that decrease in residential quality farther from the CBD. The center of all Latin American cities is the central business district. These areas are home to the best employment opportunities and they are the commercial and entertainment hubs for the city. They are also very well developed in terms of infrastructure and most have many modes of public transportation so that people can easily get into and out of them. After the CBD the next most dominant part of Latin American cities is the commercial spine that is surrounded by residential developments for the most elite and wealthy people in the city. 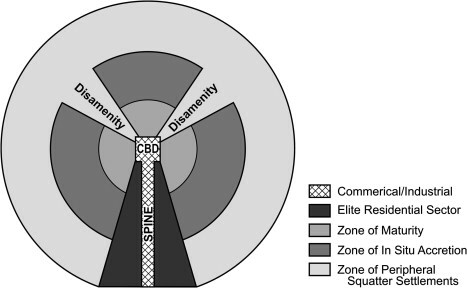 The spine itself is considered an extension of the CBD and it is home to many commercial and industrial applications. The elite residential sector is where nearly all of the city's professionally built houses are and the upper class and upper middle class live in these regions. 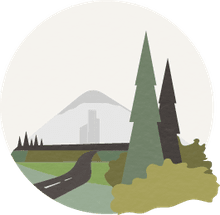 In many cases, these areas also have large tree-lined boulevards, golf courses, museums, restaurants, parks, theaters, and zoos. Land use planning and zoning are also very strict in these areas. The zone of maturity is located around the CBD and is considered an inner city location. These areas have better-constructed homes and in many cities, these areas have middle-income residents who filtered in after the upper class residents moved out of the inner city and into the elite residential sector. These areas have a fully developed infrastructure. The zone of in situ accretion is a transitional area for Latin American cities that is between the zone of maturity and the zone of peripheral squatter settlements. The homes are of modest qualities that vary widely in size, type, and quality of materials. These areas look like they are in a "constant state of on-going construction" and homes are unfinished. Infrastructure such as roads and electricity is only completed in some areas. 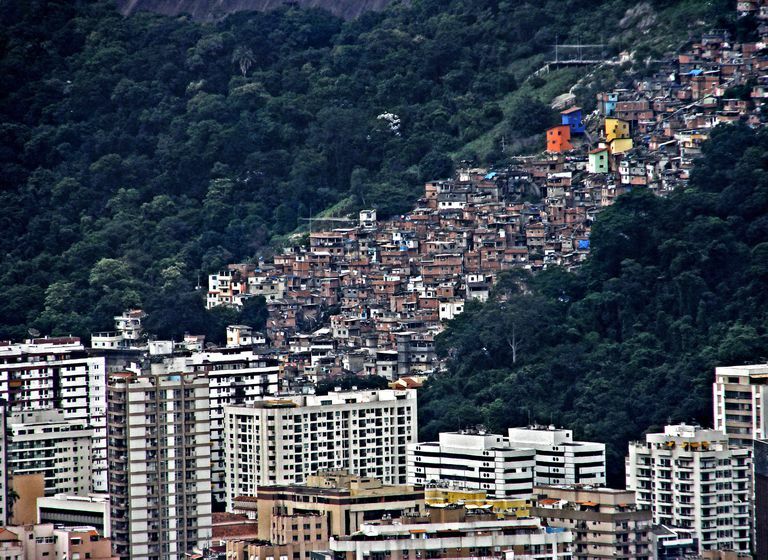 The zone of peripheral squatter settlements is located on the edge of Latin American cities and it is where the poorest people in the cities live. These areas have virtually no infrastructure and many homes are built by their residents using whatever materials they can find. Older peripheral squatter settlements are better developed as residents often continually work to improve the areas, while newer settlements are just starting. Like the age differences present in the zone of peripheral squatter settlements age differences are important in the overall structure of Latin American cities as well. In older cities with slow population growth, the zone of maturity is often larger and the cities appear more organized than younger cities with very fast population growth. As a result, the "size of each zone is a function of the age of the city and of the rate of population growth in relation to the economic capacity of the city to absorb effectively additional residents and to extend public services." 1) The new central city should be divided into a CBD and a Market. This change shows that many cities now have offices, hotels, and retail structures in their downtowns as well as their original CBDs. 2) The spine and elite residential sector now have a mall or edge city at the end to provide goods and services to those in the elite residential sector. 3) Many Latin American cities now have separate industrial sectors and industrial parks that are outside of the CBD. 4) Malls, edge cities, and industrial parks are connected in many Latin American cities by a periferico or ring highway so that residents and workers can travel between them easier. 5) Many Latin American cities now have middle class housing tracts that are located close to the elite housing sector and the periferico. 6) Some Latin American cities are also undergoing gentrification to protect historical landscapes. These areas are often located in the zone of maturity near the CBD and the elite sector. This revised model of Latin American city structure still takes into account the original model but it allows for new the development and changes that constantly occur in the rapidly growing Latin American region. Ford, Larry R. "A New and Improved Model of Latin American City Structure." Geographical Review, vol. 86, no.3, 1996. Griffin, Ernest and Ford, Larry. "A Model of Latin American City Structure." Geographical Review, vol. 70, no. 4, 1980. Why Do Central Business Districts Exist?